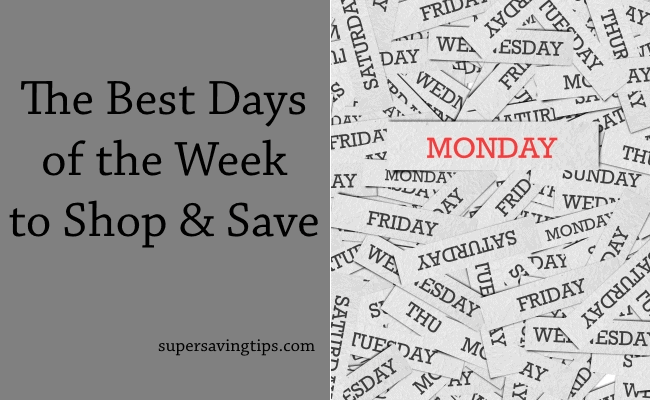 Is there really a science to looking for great deals on a specific day of the week? Well, according to some experts, there actually are better days to shop and save than others! Jot these down and next time you’re in the market for a bargain, try shopping on the best day for that category. Buying a new car? Mondays are the best deals around. Why? Pretty simple, they have the least amount of shoppers on Mondays and after what may have been a poor weekend result (weather may have affected sales, or perhaps the staff just didn’t close many deals), the salesman are “highly motivated” to start the week successfully. Dining out with the family? Try “Kids Eat Free” on a Tuesday with each adult meal purchased at many restaurants. Try searching on kidsmealdeals.com for listings in your area. Airline tickets! Save upwards of 20% on a ticket on Tuesdays. That’s because most airlines adjust their weekly ticket prices late Monday and by Tuesday morning, everyone reacts and competition creates the best deals. Buy about 6 weeks in advance of travel, and travel on a Tuesday, and you’ll save even more money according to online sources like kayak.com. Try looking for online jewelry deals every Wednesday, when research shows that prices are lower by 10% or more, according to extrabux.com. “Wine Down Wednesdays” are being celebrated at restaurants across the US, from New York to San Francisco. Get special wine prices or up to half off with dinner or snacks. Check online for local eateries. Most apparel stores start their weekend clearances and markdowns on Thursdays. That’s the time when the largest selection is available. If you wait until Saturday or Sunday, your size and favorite color may already be gone. According to gasbuddy.com, try filling your gas tank on a Friday. Weekends are the biggest fill-up days at the gas station, and that’s when the competitive spirit is most apparent. Look at all four corners on the intersection (since there are probably 3-4 stations right there) and pick the one that says bingo to you. Curl up with a good book. Saturdays are the best deals at your local bookstore. No real reason why, except the theory is that it’s a weekend and you’re looking for something to read while enjoying some down time. In any event, the booksellers think that’s how you think, so take advantage! Grocery shopping is best on Sundays. Why? Most sale circulars begin on a Sunday and despite it being a really busy day at the store, the selections are fullest and freshest so you won’t be seeking a rain check on day one of the weeklong sales. Look for next week’s circulars online before Sunday so you can plan your list and save time. This list may not win any prizes for scientific findings on the best days of the week to shop, but it may save you a few dollars on your next shopping trip. Is there something I’ve missed? Let me know what days you find the best bargains in town.